In fleamarkets and fairs all around France, you can still sometimes find quilts, tablecloths and other linens that people have carefully pieced together from scraps of vintage fabrics collected over the years. Our love of the spontaneous, one-of-a-kind beauty of these treasured textiles is what inspired us to design the Normandy quilt. 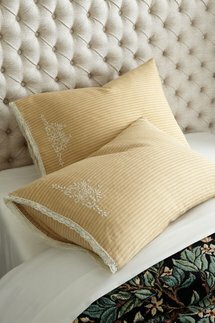 An heirloom without the wait, the patchwork design marries rustic linen grain-sack stripes and antique toile prints with cotton matelassé and embroidered monograms in a palette of soft, sun-washed hues. Framed with a generous 9" flange, it's beautifully finished with corner gathers and scalloped eyelet trim. 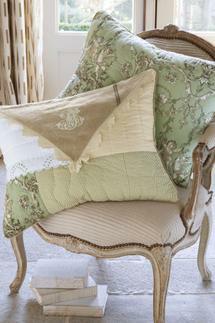 Complete the wonderful hodgepodge look with the matching shams and decorative pillow (sold separately). Cotton/linen with pure cotton fill. Pieced together with a mix of linen and cotton fabrics. 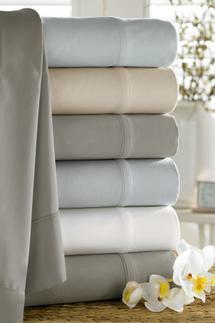 Inspired by traditional French pieced linens. Eyelet trim and corner gathers. Coordinates with Normandy shams & decorative pillow (sold separately). Machine wash cold, Gentle cycle, Only non-chlorine bleach when needed,Tumble dry low, Warm iron if needed, Do not dry clean.